Devin Osman, a 2nd grader at Legacy Academy won second place in an essay contest sponsored by the Elizabeth Library. The topic of the essay was “Your favorite holiday memories.” Great Job Devon! 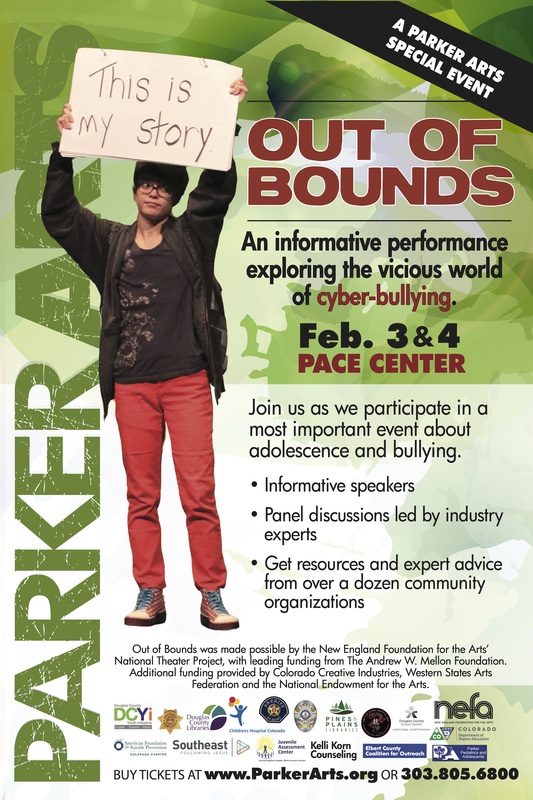 Parker Arts is encouraging families and their children, in grades five through nine, to attend an arts-based approach to help deal with cyber bullying, on Feb. 3, 2016. The PACE Center doors open at 5 p.m., with the events on stage starting at 5:30 p.m. Over a dozen resources will be available throughout the PACE Center foyer that evening, to help families navigate cyber bullying, and offer their educational expertise on bullying, counseling and suicide prevention. Tickets are $12 for adults, and 18 and under are free. Seats can be reserved by calling 303.805.6800, or by going online to http://www.ParkerArts.org. Our school is proud to partner with the American Heart Association to help kids with special hearts! Mark your calendars for our upcoming annual Jump Rope for Heart event taking place in a gym during PE classes on: Thursday, February 18th. Collection Envelopes are due February 25. Help Your Child Save Lives and be a Heart Hero! How: Support your child in the American Heart Association’s Jump Rope Heart program. What: A life-saving and educational community service program. Why: Your child will help kids with special hearts, learn about how to be heart healthy, know importance of the heart – how it works, and how to take care of it to feel good! We hope you are as excited as we are to support our students in this important experience! If you have any questions or would like to volunteer during the event, please let me know. Let’s help our children be heart heroes! 3 more weeks to fundraise and collect donations. Each student will have a chance to earn prizes (incentives) for themselves based on their individual totals. Raising money for AHA though our school also has the opportunity to earn free physical education equipment. National School Choice Week provides an unprecedented opportunity every January to shine a positive spotlight on the need for effective education options for all children. Independently planned by a diverse and growing coalition of individuals, schools, and organizations, National School Choice Week features thousands of unique events and activities across the country. The Week allows participants to advance their own messages of educational opportunity, while uniting with like-minded groups and individuals across the country. Thanks for choosing Legacy Academy! We are always adding to our list of applicants to sub at Legacy Academy. Legacy Homeschool Academy is looking for substitutes for the 2015-16 school year. The Homeschool program is located at Creekside Community Church. Visit the Homeschool tab for more information about the program. To ensure the safety of our children and staff, please make sure to follow our carpool guidelines. Please pull all the way forward when dropping off and make sure your children are ready to exit your vehicle. We do ask that you do not leave your vehicle at any time, but allow our staff to assist your children. Also, please do not pass vehicles to park in a different spot. Thank you for entrusting your children to us. Legacy Academy was well represented at the District Bee! Of the top four spellers, three were our students. Jake Ledesma from Mrs. Wiens’ class challenged the eventual winner (Coy Weber from RCE) to 56 rounds of spelling before missing his word, thereby earning 2nd place. Cody Bell from Mrs. Grassnick’s class was 3rd, and Alex Martinez from Ms. Heintz’s class finished 4th. They all did GREAT!! Congrats Legacy spellers! Nerf Night 6:00pm to 8:00pm in Legacy Academy gymnasium! This is an excellent time for families to play together. Parents are encouraged to play! We have successfully raised funds for our Character Education Program and now we are trying to fund a new sound system for the school. Ages 7 and up (6yr olds may play if a parent is in the gym with them at all times, but all parents should stay for the event). The cost is $10.00 per person. Students may not bring their blasters to school during school hours. Bring your own blaster to the event. Do not bring ammunition, ammunition and protective eyewear is provided. Parents will be required to sign a waiver prior to this event, no exceptions will be made. The waiver will be available at the office during school hours or at the event. 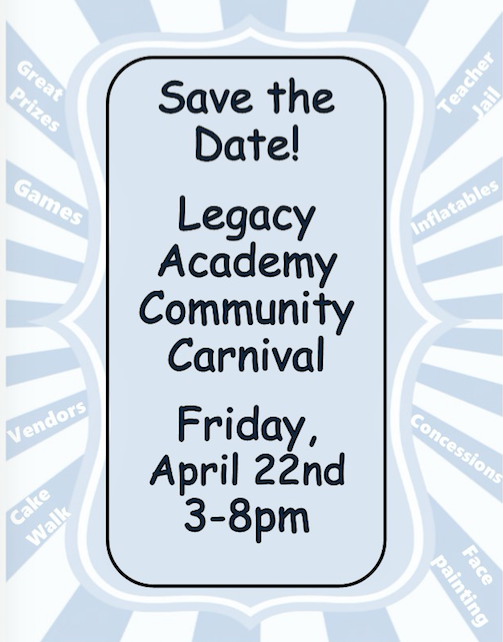 If any questions, please e-mail LABD@legacyk8.org.